In the second novel of the DeFiore Brothers series most of the characters from the first book return for another Italian romance. But this time the protagonists are Dante’s older brother Stefano, a widower filled with guilt, and Lizzie’s sister Jules. The two characters are so very different that despite the fact that they fall for each other early on, a happy ending seems impossible for them. But slowly, they begin to trust each other and reveal their painful secrets only to realize they are far less painful when shared with someone who cares. I was also very happy to see Dante and Stefano’s father slowly but surely letting himself be happy again in female company. I thought this was a very sweet, if brief, subplot. There were some inconsistencies, like when Stefano was described as enjoying some downtime and seven sentences later he practically begs his father to give him work to do so he wouldn’t think of Jules. Also, having just finished the first book in the series, the biggest drawback of this novel was that it was too much like the first one. The characters or the plot didn’t bring anything much new, particularly in the first half of the story. I wished for fresh storylines and fewer clichés. One thing that stood out and painted Jules as a strong individual, however, was how she realized it was time she started making her own decisions and not let Lizzie guide her through life anymore. Lizzie had always been her big sister and Jules loved her dearly so it was a hard choice to tell her she would not attend grad school even though Lizzie wanted her to and had already paid her tuition fees. This decision made me like Jules that much more. 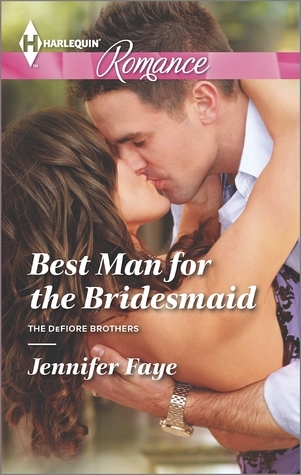 Best Man for the Bridesmaid is a sweet read and you don’t have to read the entire series to be able to follow the story or get to know the characters. It brings a nice dose of the wedding fever, repressed emotions and angst, and ties it all up in Stefano and Jules’s romantic reunion at the wedding.